LIMITLESS INTENSITY, LIMITLESS ENERGY, LIMITLESS REPS We called our pre-workout Magnum LIMITLESS for a reason. You’ll feel a powerful rush within minutes of gulping this delicious hyperactive cocktail. LIMITLESS is specifically formulated to provide that instant blast of intensity you need to crush personal records in the gym. With every passing second, you’ll feel more energetic, leading to unimagined ferocity in the gym. And the best part? The effect lasts for hours with no crash whatsoever – you can just keep going hard. Did we mention the insane pumps? With every rep you can feel the blood expanding your blood vessels and rushing through to feed your muscles. Maybe you could use your old pre-workout for cardio? WHY IS IS YOUR BEST CHOICE FOR A PHARMACEUTICAL GRADE PRE-WORKOUT PRODUCT? Unequaled when it comes to stimulation, pumps, and strength. Two-tiered, time-release flavoring systems, so it tastes amazing. Author : Apicella, J.M., et al. 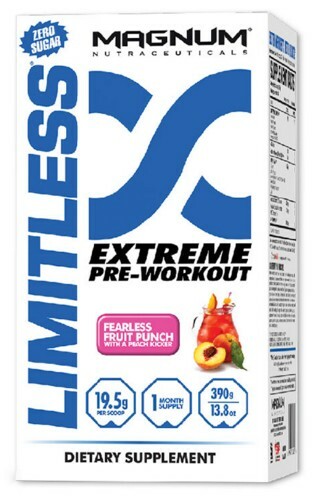 LIMITLESS utilizes four different types of Creatine in its ISOPOWER COMPLEX™ .This ensures that the maximum amount of strength, power and muscle recovery is reached with the least amount of water retention. Creatine Pyruvate is one of the key creatines because it is absorbs the fastest. In fact, Creatine Pyruvate is much more soluble than creatine alone and it takes much less to do the job. Pyruvate on its own helps to stimulate glucose transfer from the blood and into muscles during exercise and at rest – priming muscles with the carbohydrate content that is essential for greater endurance. Magnum LIMITLESS includes the potent mental stimulant Bacopa monnieri 30:1 Extract (50% Bacosides A&B). This perennial is one of the most important medicinal herbs used in Ayurveda for cognitive enhancement and stress reduction. The active compounds in Bacopa are called bacosides. These compounds regulate serotonin and dopamine, which contribute to overall cognitive power, energy and concentration. All of these clinically dosed Pharmaceutical Grade ingredients and so many more, such as Pine Bark Extract (Pinus Radiata) 90% Oligomeric Pro. Pine Bark Extract stimulates eNOS in arterial cell walls, expanding blood vessels up to 78 per cent. Pine Bark Extract has been found to greatly enhance blood flow and oxygen transport to the muscles for huge LIMITLESS pumps. Magnum LIMITLESS is an unequaled pre-workout supplement – try it yourself and see what all the excitement is about.